:This Two-toned Bible cover features Scripture from Jeremiah 29:11, in debossed text, and a delicate leaf garland. The burgundy and sand Bible cover is constructed of quality man-made material imported from Italy, with the look and feel of real leather (trade name LuxLeather). There is an exterior zipper with a cross engraved zipper-pull, a convenient lay-flat spine handle and 2 pen loops inside. 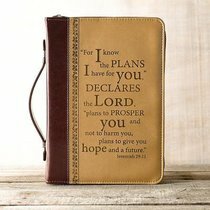 About "Bible Cover Classic Xlarge: For I Know the Plans....Burgundy/Sand (Jer 29:11)"
The supplier of this item is out of stock. There will be a delay in the fulfillment of this item. We will keep your order on file and notify you of any changes to this items status.